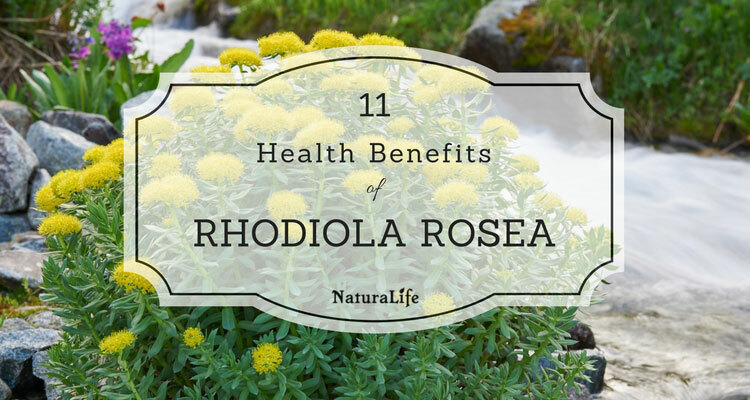 Rhodiola rosea is an adaptogenic herb that’s packed with an immense list of health benefits. This remarkable herb is so effective that Olympic athletes, master chess players, Chinese emperors, and even political leaders have used it. All because rhodiola optimizes the mind and body. And since it’s an adaptogenic herb, it can also help you cope with all forms of stress, whether it’s physical, emotional, or environmental. Rhodiola rosea can also increase your focus, physical endurance, and give you sustained energy throughout the day. For this reason, I use rhodiola nearly every day. But this is just the tip of the iceberg. Rhodiola does so much more. I think it’s safe to say most of us would love to have more energy in our day-to-day lives. Fortunately, rhodiola rosea is one of the best herbs you can take to improve your energy levels. In fact, several studies have shown that rhodiola can significantly reduce the amount of mental and physical fatigue you experience from stress. One study found that even a low dose of rhodiola (170mg/day) dramatically reduced the amount of stress-induced fatigue experienced by doctors working the on-call night shift (1). By increasing their energy levels, rhodiola also increased their mental and physical performance. So if rhodiola can help stressed out doctors have more energy, it’s likely rhodiola can do the same for you. Another study looked at the effects of a rhodiola extract on students, scientists, and doctors. They make for good test subjects since their lives can get stressful. Those who took rhodiola during stressful events (such as final exams) produced work that had significantly higher quality than those who did not take rhodiola. All because the rhodiola prevented fatigue and stress from getting in the way of their work (2). When you get stressed out to the max, what happens shortly after? You feel drained and tired. Stress depletes your energy stores because when you’re stressed, your body is working in high gear. Rhodiola improves your energy levels by preventing stress and increasing your body’s ATP production (3). If you struggle with fatigue, evidence suggests rhodiola can significantly boost your energy levels. Rhodiola can turn you into an athletic powerhouse. As mentioned above, rhodiola can provide a significant boost in your energy levels. This alone can lead to drastic improvements in your physical capabilities. But increased energy isn’t the only reason rhodiola can make you feel like a machine through your next workout. Rhodiola biochemically changes your body to give you more endurance and help you recover faster from exercise. One study found that rats who were given rhodiola could swim for 25% longer before exhaustion. This was compared to rats that did not receive rhodiola (3). But rhodiola didn’t provide these effects just because it reduces stress-induced fatigue. 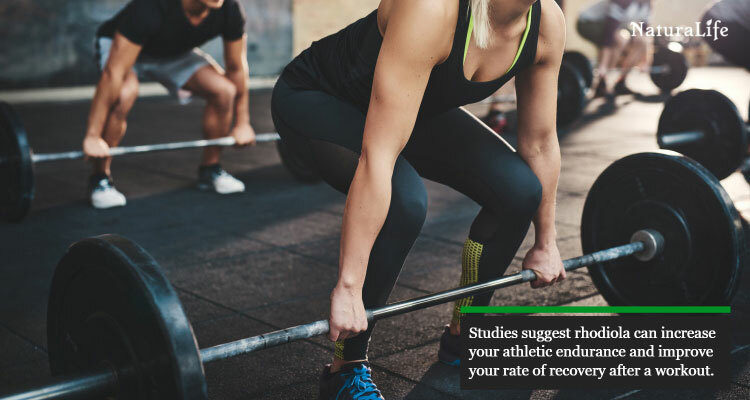 The researchers who designed the study discovered that rhodiola increases physical performance by stimulating the production of ATP (adenosine triphosphate) in the body. ATP is the main source of energy for your cells. But the evidence isn’t just limited to rats of course. Increase how long you can perform endurance-based exercises such as running or swimming (4). Improve muscle recovery and decrease inflammation by protecting your muscles during exercise (5). Increase your stamina and endurance by indirectly increasing your red blood cell count. Rhodiola does this by stimulating erythropoietin (6). But you don’t need to be an athlete to receive these benefits. 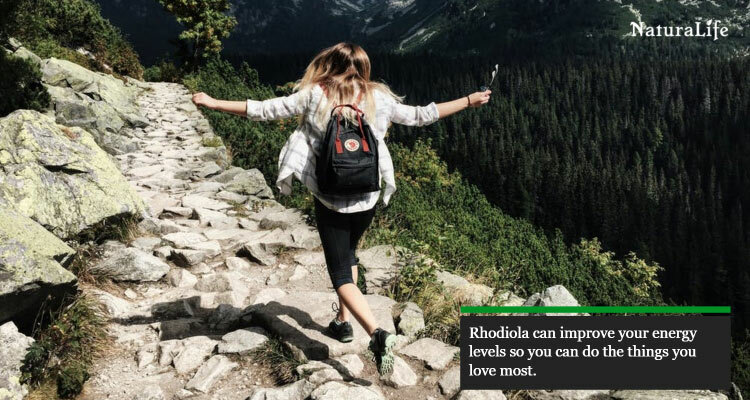 Rhodiola can help you out with anything that requires physical activity whether it’s gardening or going for a long hike. Rhodiola rosea can increase your physical endurance, stamina, and performance. Another impressive benefit of rhodiola is that it can help your body burn off your stored fat. That’s because rhodiola contains an active compound called rosavin. In short, rosavin shifts your body’s metabolism to burn fat for fuel (opposed to carbohydrates). Rosavin stimulates an enzyme called hormone-sensitive lipase. This enzyme can specifically target stored fat in your body. It then burns this stored fat for energy (7). Evidence suggests that you can melt even more fat off your body by combining a rhodiola supplement with regular exercise and calorie restriction. One study found that taking a daily rhodiola extract in combination with a low-calorie diet lead to an 11% reduction in total body fat (8). The participants who didn’t take rhodiola experienced a 9% body fat reduction on the same calorie restricted diet. Those who took rhodiola lost an average of 19 pounds, whereas those who didn’t, lost an average of 9 pounds. The point is, rhodiola rosea is a fantastic supplement to help you get that lean physique you’ve been trying to get all your life. Just don’t use it as your only method to burn fat, because you won’t get amazing results. So it’s best to combine rhodiola with other weight loss efforts. Early evidence suggests rhodiola rosea can redirect your body’s metabolism to burn fat for energy. There was a time in my life where I was plagued with depression. After trying several alternative approaches, I discovered that rhodiola rosea was my saving grace. Paired with meditation, it completely lifted my spirits in less than a month. And my case wasn’t just a fluke. Evidence suggests that rhodiola is tremendously effective for the treatment of depression (9). 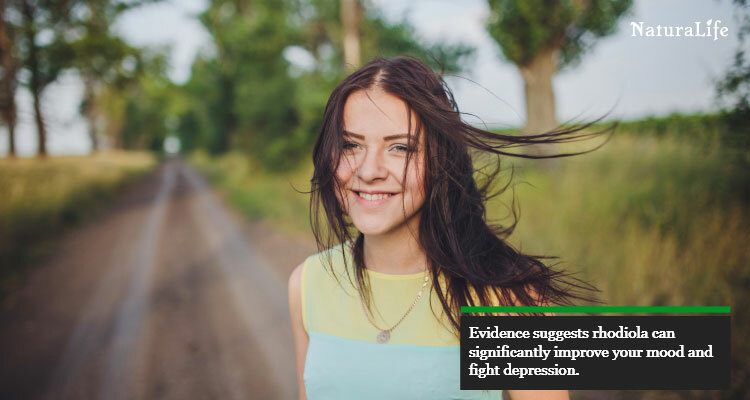 Some scientists even claims that it’s a better alternative to prescription antidepressants. This is because while rhodiola may be slightly less effective, it has significantly fewer side effects. Juliette Bergman was working at the World Trade Center during both bombings in 1993 and 2001. She lived to tell the tale, but it was a traumatic experience to say the least. She suffered from PTSD and depression as a result. For eight years Juliette was on anti-depressant drugs. And they took their toll. She gained 35 pounds and still couldn’t’ shake her depression. That’s until her doctor gave her rhodiola in place of her antidepressants. Rhodiola completely turned her life around. She went from fatigued to energized. From depressed to happy. And best of all, she didn’t experience any negative side effects unlike the antidepressant drugs. Rhodoila has a protective effect on the neurotrasmitters serotonin and dopamine in the brain (10). In this way, it increases your levels of dopamine and serotonin. Rhodiola positively affects beta-endorphin levels in the body. Rhodiola has a positive effect on your mood by preserving the feel-good chemicals in your brain. Rhodiola is an herb that can elevate your mood and fight depression due to its protective effects on key mood neurotransmitters. We all want a sharper and more focused brain. And it turns out, rhodiola is a powerful nootropic: a substance that improves the function of your brain. 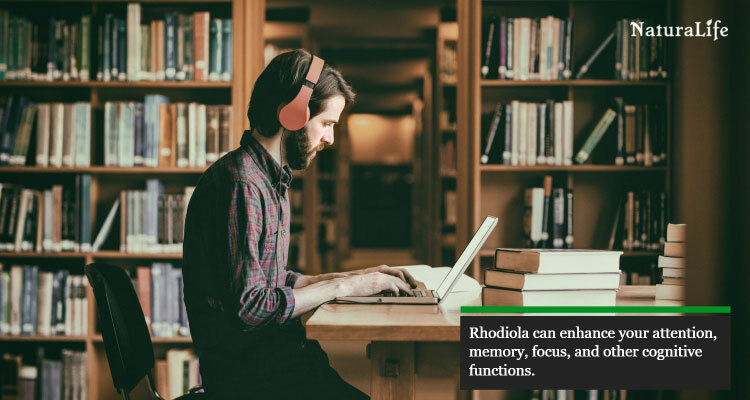 According to Dr. Richard Brown of Colombia University, rhodoila is exceptionally beneficial because it enhances your attention, memory, learning, and other cognitive functions. But the benefits don’t end there. Breaking evidence also suggests that an active component in rhodiola, salidroside, can protect your brain from oxidative damage (11). In other words, it could help protect your brain from aging and diseases such as Parkinson’s or Alzheimer’s. Rhodiola rosea can enhance your attention, memory, learning, and even protect your brain from the effects of aging. There’s still debate of whether adrenal fatigue is real. But there’s no denying the stresses of today’s world can get overwhelming. And when your stress all the time, it begins to take a huge toll on your body. Namely, chronic stress overclocks your adrenal glands. It makes them work too hard. Over time these tiny glands can tire out which theoretically results in adrenal fatigue. A condition that’s infamous for its mind-numbing fatigue. So, the solution to adrenal fatigue would be to eliminate the root cause (stress) and balance the adrenal glands. Amazingly, that’s exactly what rhodiola does. It’s important to realize, however, that it may take as long as 2-3 months to cure adrenal fatigue. Since rhodiola balances your body, it can take some time to achieve results—but it’s totally worth the wait! While there haven’t been many studies to verify the effect of rhodiola on adrenal fatigue, many medical professionals claim it works quite well. 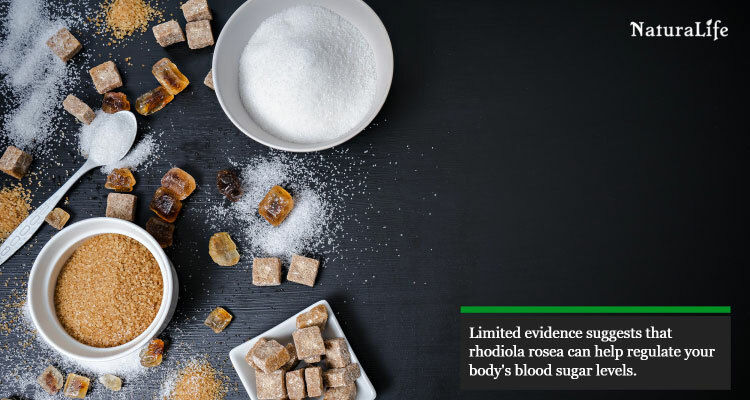 Evidence suggests that rhodiola can even provide benefits for those who have blood sugar problems, diabetes, or hyperglycemia. This is so important in today’s world because nearly everything has obscene amounts of sugar. You will feel exhausted all the time. Your risk for diabetes or hyperglycemia will be significantly higher. You will become dehydrated as your kidneys try to flush out the excess sugar in your blood. Your blood sugar levels will crash, which can stop your mitochondria from working properly. This can also result in excess free radicals (which cause disease and aging). While only a healthy diet can prevent these problems, rhodiola can make your body much better at regulating your blood sugar levels. One study found that 12 weeks of rhodiola and cinnamon supplementation significantly decreased blood glucose (sugar) levels in diabetic mice (12). Another study found that salidroside (an active compound in rhodiola) regulates the blood sugar levels in obese mice (13). And lastly, studies suggest that the rosavin found in rhodiola can decrease blood sugar levels (14). Evidence suggests that rhodiola can improve your body’s ability to regulate your blood sugar levels. Rhodiola may also be a fantastic supplement for the winter months. That’s because it can strengthen your immune system. Rhodiola strengthens your immune system by increasing the number and activity of your immune cells. Rhodiola extracts have been shown to significantly increase the levels of th1 cytokines, enhance cellular immunity, and decrease pro-inflammatory cytokines (13). In other words, it strengthens your immune system without promoting inflammation. 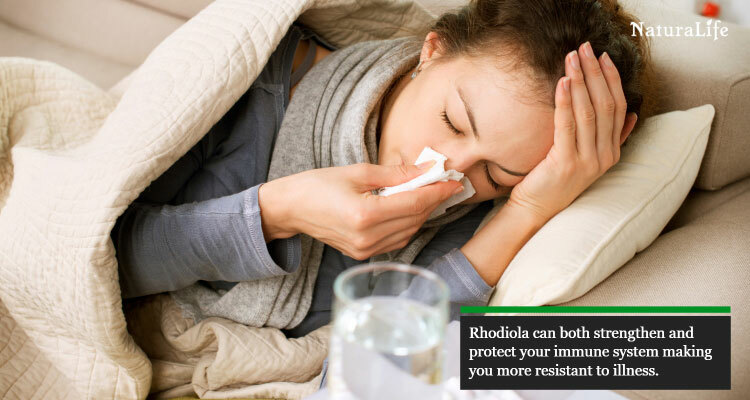 Rhodiola can also protect your immune system. One study, for example, found that rhodiola extracts can shield T-cells from death when infections get into the blood (14). Rhodiola shields T-cells by inhibiting the expression of apoptotic genes. The only issue with the stimulating effect of rhodiola is with autoimmune disease. It’s not suggested for people who have autoimmune disease because it could make the condition worse. Rhodiola can strengthen and protect your immune system. But it’s generally not recommended for those with autoimmune problems. Perhaps one of the most impressive benefits of rhodiola is its ability to help fight cancer. There’s a lot of downright false “anti-cancer” claims out there. But this is not the case with rhodiola. The evidence out there seems to suggest that rhodiola acts by suppressing the spread and growth of cancer cells. Rhodiola extracts can decrease the growth of bladder cancer cells (15). Salidroside, an active compound in rhodiola, can prevent colon cancer (16). Rhodiola extracts are shown to stop the growth and spread (metastasis) of tumors in the liver (17). Rhodiola is also shown to protect your cells from free radical damage. It also can protect your DNA from cancer-causing toxins (13). 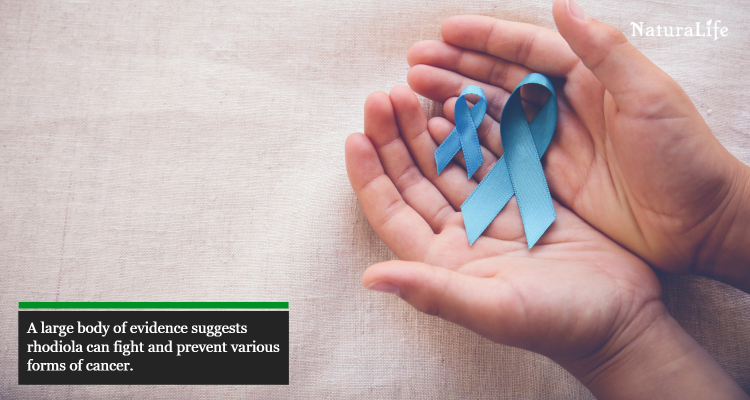 An impressive body of evidence suggests rhodiola can both fight and prevent cancer. The number 1 leading cause of death in the world is heart disease (18). And it’s been that way for quite some time now. With that in mind, if you’re interested in living a long and healthy life, you should take great care of your heart. Evidence suggests that rhodiola can protect your heart from getting damaged (19). Another study in 2004 indicated that the bioactive compounds in rhodiola (salidroside, rosin, rosavin, rosarin, tyrosol) may inhibit stress-induced heart damage and prevent an irregular heartbeat from occurring (17). Heart disease is the leading cause of death. 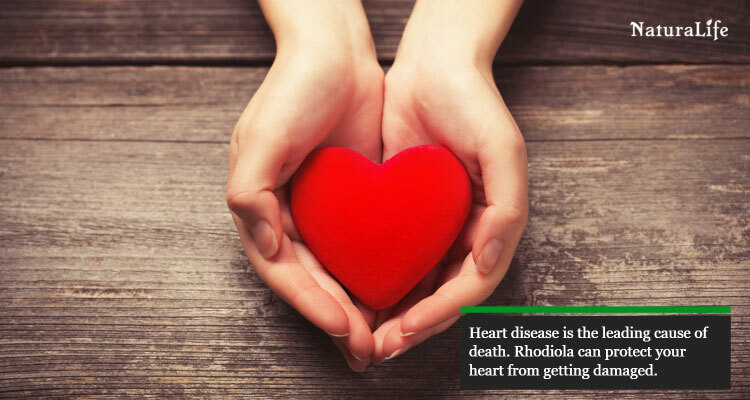 Rhodiola can help you avoid this fate by protecting your heart from damage. There’s also countless people who rant and rave about rhodiola and its ability to help with anxiety. And it turns out that it’s not some kind of ineffective health trend. Rhodiola rosea can provide considerable anxiety relief. Early evidence suggests a 170mg extract of rhodiola rosea can significantly reduce anxiety (20). There’s also a couple scientific articles that support the link between rhodiola and its ability to decrease anxiety (21, 22). The evidence goes beyond what I have mentioned. But the problem is, this evidence is in foreign languages (e.g., Russian and Chinese). Unfortunately, there aren’t any more studies that look at the effects of rhodiola on anxiety. It’s possible that rhodiola is effective for anxiety given the countless success stories and limited evidence. But to be sure, more scientists need create studies on the subject. That’s why most people suggest just trying it out to see if it works. As always, just consult a health professional before deciding to do so. Some evidence and personal success stories suggest rhodiola can help ease anxiety. More evidence is needed to be sure. When it comes to supplements, quality makes all the difference. For your convenience, I hand-picked two of the best rhodiola supplements on the market. I picked one powder and one extract to give you the freedom to select which supplement type you want. If you want to see the criteria I used to select these supplements, just scroll to the next section. This is by far the best rhodiola extract that’s out there. While most supplements have around 3% Rosavins and 1% salidroside, Jarrow Formulas blows this norm out of the water. This product contains a whopping 5% rosavins and 1.86% salidrosides. I had to personally contact the company to find this data. If you prefer the “whole plant” approach opposed to extracts, this is the best supplement you will find. It’s grown in its native Siberian environment and freeze dried right after harvesting. That way it retains the maximum amount of phytochemicals. This product maintains the 3-1 salidroside to rosavin ratio. Picking the right rhodiola supplement can be the difference between no results or superb results. Quality makes all the difference here. That’s because most of the benefits of rhodiola come from its bioactive components. A low-quality supplement will contain low levels of these bioactive components. The result is a useless supplement that’s a complete waste of money. High quality rhodiola supplements, however, are different. They’re cultivated with care and grown in their native environment. The result is a supplement that contains an abundance of beneficial compounds. But finding a high quality rhodiola supplement can be time-consuming and downright challenging. That’s why I picked out 2 of the best rhodiola products out there on the market. One for each type. But if you want to find another brand for some reason, I’ll teach you how to pick out a supplement. The truth is, both are effective. Whether you pick powder or extract depends on your body. Some experts advocate that rhodiola powder is better. That’s because when herbs are in their natural state, everything is intact. As a result, the active ingredients may act synergistically to produce the full effects of the herb. It’s also best to opt for the powder if you find that your body is sensitive to things like caffeine or medication. Powders aren’t concentrated like extracts are, so they fare better for sensitive people. Rhodiola extracts, on the other hand, are much more potent. This means you will get significantly more rhodiola out of a dose compared to whole rhodiola root. An extract will have a stronger effect on you. You may also notice the benefits more. Just remember that extracts are much stronger so if you have a sensitive body or digestive system, it may cause minor discomfort. You could always start with the powder and then move on to the extract if all goes well. Since most people want results as soon as possible, however, an extract may produce the best results. I personally like the extracts better, especially since most studies use extracts. But I will change to a powder every now and then to switch it up. Some people for some reason choose to drink rhodiola tea. But there’s a few problems with this. First, when you consume tea, you’re not getting the full herb. Many of the beneficial compounds do not dissolve into water. The other issue is that there are no studies that I’m aware of on the effects of drinking rhodiola tea. So it’s very possible that drinking rhodiola tea could provide few benefits. Because of these reasons, I do not suggest drinking it as a tea. A powder or extract would yield significantly better results. The supplement should contain at least 3% Rosavin and 1% Salidroside. If they don’t say, it’s likely the brand has less. If you want to get the most benefit out of your supplement, always look for these numbers. A high quality rhodiola supplement will contain rhodiola that’s grown in its native Siberian environment. This ensures the highest level of phytochemicals. Supplements MUST contain rhodiola rosea. If it doesn’t contain “rosea,” it’s a fake. Do not buy it. Must be always processed with low-heat, whether it’s a powder or extract. High-heat processing destroys the beneficial compounds. Another difficulty people face when selecting a rhodiola supplement is knowing what dosage to get. Every brand seems to have a different amount. Evidence suggests that some people can expect to see improvements in fatigue with doses as little as 50mg of a high-quality extract. But 50mg is a very low dose. Most won’t notice any significant changes or benefits with this dosage. But you should never exceed 680mg per day since studies show that anything above 680mg may be ineffective. The best thing to do is find a supplement in the middle range—around 300-400mg. You can always work your way up from the middle ground if you find it needs to be stronger. Note: These suggestions are for extracts. Since powders aren’t as strong, you are likely safe with following the directions on a high-quality powder. I don’t suggest staying on any herbal supplement for more than 3-4 months. When you get to the 3-4 month range, your body begins to adapt and the herb begins to have less of an effect. Plus, it’s good to take a break since doing too much of anything is never a good idea. To deal with this issue, I cycle my doses. So when I first took rhodiola, I took it for 2-3 months so that the effects could come in full force. After that, I took one week off. Then I would take rhodiola for another 3 weeks and then take a week off. Natural remedies still have side effects—don’t let anyone tell you otherwise. The thing is, natural remedies typically have fewer and less severe side effects compared to pharmaceutical drugs. And this is 100% the case with rhodiola rosea. In fact, a large scientific review on rhodiola suggested that there are no clinically significant side effects of rhodiola rosea (23). Sleep disturbances: Since rhodiola is a stimulant, some people have trouble falling asleep if they take rhodiola at higher doses too close to bedtime. On the contrary, other people suggest it improves your sleep. Even the evidence is a mixed bag (12). The best way to find out here is to see for yourself. Blood thinning: While rare, it’s important to consider this. You don’t want thinned blood before surgery. Or if you’re already on a blood thinner, it may not be a good idea to combine with rhodiola. Nervous excitability: People who are prone to getting excessively nervous may get worse with rhodiola. 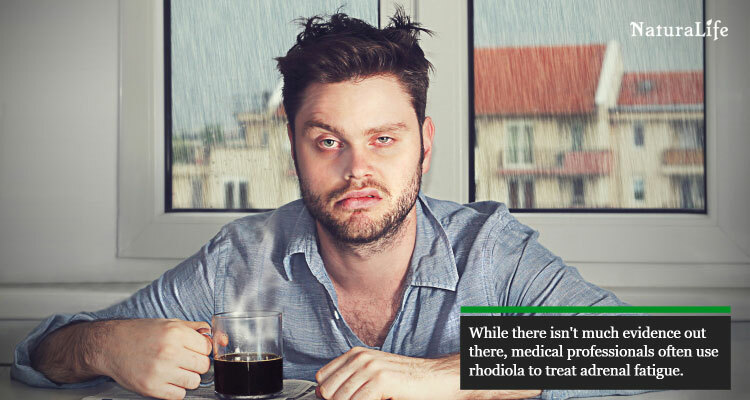 If you have this issue, you should not take rhodiola without consulting a healthcare professional first. If you have an autoimmune condition, it may be best to avoid rhodiola. Since it’s regarded as an immune stimulant, it can potentially worsen symptoms. Since rhodiola is a mild herbal stimulant (not like caffeine), in rare cases it may worsen anxiety. But in most cases, it helps it. That’s why it’s always best to work your way up to higher doses. Always start small. Also, if you’re pregnant or breastfeeding, you should also not take it because nobody has tested its safety. We simply don’t know if it’s safe, so it’s not worth the risk. Before taking rhodiola, it’s a good idea to make sure it won’t interact with any medication you’re currently taking (if any at all). Some scientists propose that rhodiola can interfere certain antidepressant drugs. This includes SSRIs, SNRIs, and benzodiazepines. In vitro (test tube) studies suggest that rhodiola can inhibit an enzyme called CYP3A4 (scientists got real creative with this one) (24). This means it could compromise any drugs that induce that enzyme. For a full list of these medications, you can go here. Some suggest rhodiola can negatively interact with some thyroid medications. But I haven’t seen any evidence to support this. Rhodiola rosea natively grows at high and cold altitudes in Canada, United States, Arctic areas of Europe and Asia. Rhodiola rosea is a powerful adaptogenic herb that’s tremendously effective at helping your mind and body in over 11 different ways. And rhodiola doesn’t provide any ordinary benefits. These benefits specifically help the most common struggles of the modern world: stress, fatigue, cancer, heart disease, depression, and brain fog. It’s truly a remarkable herb. But to take full advantage of these benefits, you must choose a high-quality supplement. Otherwise, you will be wasting your hard-earned money. If you have any additional questions, feel free to comment below and I’ll get back to you as soon as I can. If you’ve taken rhodiola, comment if you’ve noticed any benefits that I haven’t mentioned here. I would love to hear your story. Unfortunately, I cannot give you medical advice for legal reasons. When I am selecting rhodiola supplements I make sure it has at least 3% rosavins. For the dosage, please refer to the section I wrote Labeled “Rhodiola Dosing.” It should answer all your questions there. Let me know if you need me to clean anything else up. Is Rhodiola Rosea best taken with food or on an empty stomach? Thanks for the info! Everything i needed to give this a try!! Hello ? Had a question, If it makes you tired are you taking to much or too little? Everyone reacts differently, but I have never heard of it making people more sleepy. Can you attribute the sleepiness to anything else maybe that may have occurred at around the same time? Are you taking it close to bedtime? If so, maybe it’s disrupting your sleep. But other than that, I usually have luck with following the recommended dosage on the bottle (although the recommendation can vary depending on which brand you got). Best of luck with your natural medicine journey!